Director General Dr. Emmanuel Nkurunziza said, "Our decision to work towards ISO 9001 accreditation demonstrates our commitment to providing a high-quality and consistent service to our clients and our ongoing investment in technology, development and processes and procedures." To become ISO 9001 compliant, RCMRD underwent an evaluation process that included quality management system development, a management system documentation review, pre-audit, initial assessment, and clearance of non-conformances, all of which work to identify corrective actions that eliminate non-conformance to the quality management standard. 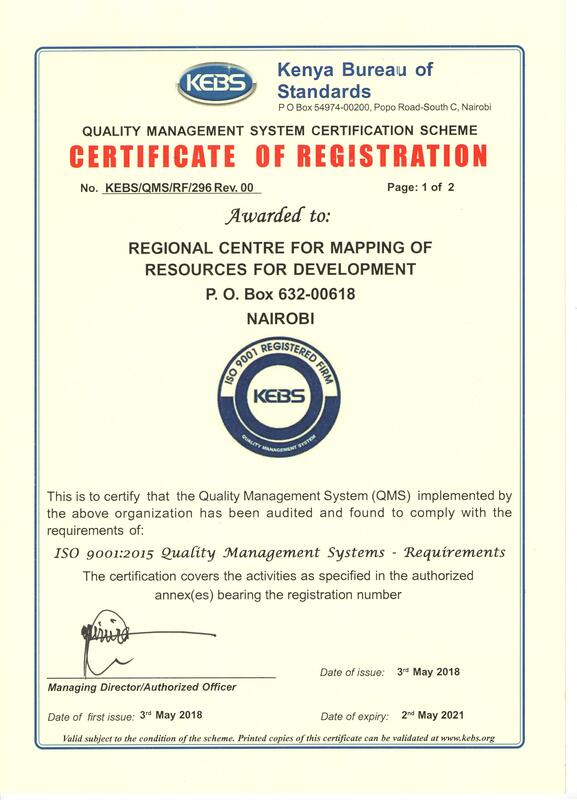 Team RCMRD were delighted to be formally presented with their certificate by KEBS, who says of RCMRD’s achievement, "The ISO 9001:2015 standard demands a high degree of leadership commitment and is underpinned by risk- based thinking." RCMRD's successful certification is testament to the positive engagement of colleagues at all levels, and demonstrates a clear desire to embrace the standard as a fundamental element of its growth and customer focus strategies." RCMRD's successful certification is testament to the positive engagement of colleagues at all levels, and demonstrates a clear desire to embrace the standard as a fundamental element of its growth and customer focus strategies. To ensure consistent quality services, the Centre put in place quality management systems in all its operations. Dr. Nkrunziza said, "Indeed, early this year, after successful comprehensive external audits, the Centre was awarded the ISO 9001:2015 quality management certification, an upgrade from the ISO 9000:2008 it received in 2014." 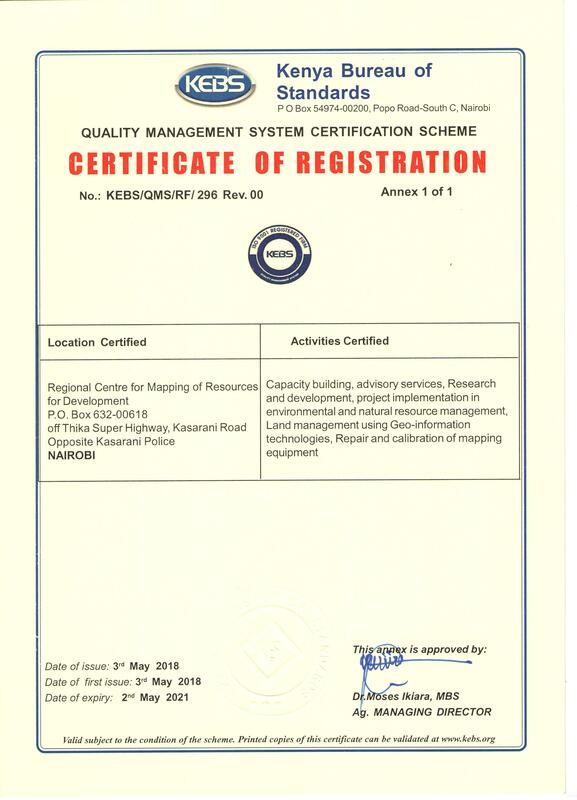 This new certification was officially launched by the Cabinet Secretary for Lands and Physical planning, Republic of Kenya MS. Farida Karoney at the opening ceremony of the RCMRD International Conference in August this year. Besides, the ISO quality management system, the Centre has also instituted other measures, including adoption of a data management policy last year as well as setting up of a quality assurance committee that examines all services and products before they are delivered to the clients.